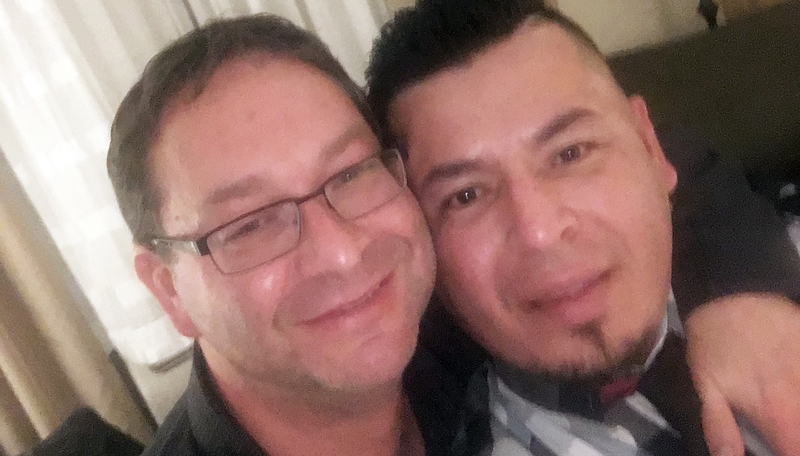 Before Paul Frame went with his husband, Jose “Ivan" Nuñez, to the U.S Citizenship and Immigration Services (USCIS) Office in Philadelphia to have the validity of their marriage confirmed, he thought the couple would be in and out in half an hour. Instead, Immigration and Customs Enforcement (ICE) officers showed up during the meeting, arrested Nuñez and took him to a detention center in York County. Frame emotionally recounted the experience during a press conference on Monday, Feb. 19, at the William Way LGBT Community Center in Philadelphia. The event was co-hosted by Juntos, an immigrant rights group, and GALAEI, a queer [email protected] social justice organization. Surrounded by friends and supporters, Frame, who lives in Chester County, spoke of his relationship with Nuñez. The couple met at a wedding in Reading during the summer of 2014. About a year later, Frame proposed to Nuñez during a trip to Las Vegas. The two men were married in April 2016. Because Nuñez is undocumented, the couple sought an interview with USCIS to get their I-130 (or a petition for an alien relative) to change Nuñez’s immigration status. The meeting took place on Jan. 31. While the couple’s marriage certificate was approved during the interview, Frame said he was asked to leave the room shortly after the meeting began. Frame believed USCIS simply must have had a few additional questions for his husband. Then, the couple’s lawyer approached Frame to tell him that ICE agents had taken Nuñez. Frame said the situation was difficult for him to understand. Since then, Frame has visited his husband at the detention center two to three times a week, where he tells Nuñez of the immense support his case has received. Prior to the press conference, a petition launched by GALAEI and Juntos calling for Nuñez’s release had already collected hundreds of signatures. Nuñez initially fled Mexico to come to the U.S. out of fear of being violently persecuted for his sexual orientation in his hometown. Gonzalo Peralta of Audrey Allen Immigration Law, the firm representing the couple, said during the press conference that Nuñez has no criminal record, but he did have an order for removal issued against him in 2010 because he is undocumented. Erika Almiron, Executive Director of Juntos, explained that it is not common for ICE agents to seize people during USCIS interviews, but incidents like Nuñez’s have been on the rise in the past year under the administration of President Donald Trump. “This is something we’re seeing more of in Philadelphia and across the country,” Almiron said. Juntos Communications Manager Miguel Andrade emphasized that the couple’s situation not only shows how the Trump administration is targeting immigrants and people of color, but the LGBTQ community as well. Now is the time to take a stand, he said. Chris Bartlett, Executive Director of William Way, spoke of how the LGBTQ community has long recognized the importance of fighting for immigrant populations. He pledged his organization’s support for Nuñez’s cause, offering any resources and support that William Way can provide.